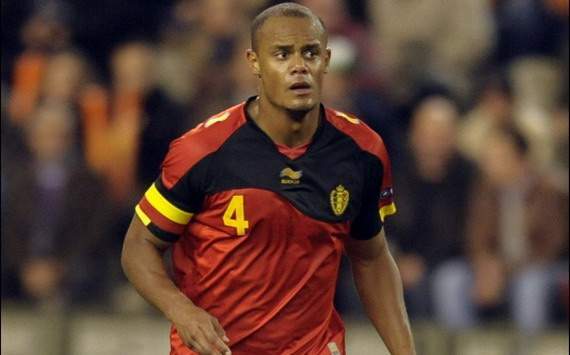 The Pirates' Tale: Belgium desperately need their players to adapt to International football. Belgium desperately need their players to adapt to International football. It’s that time of the year again; the summer transfer window. When players are rumoured to be signing for 4 different clubs at the same time. Every year there’s one club that’ll overspend, or find the next big thing. However it’s very rare to see such a drastic move of one nationality of players within one transfer window. A total of 5 Belgian players have either transferred to/or within the Premiership this window, joining 9 other Belgian players already playing their trade in the top English league. So why is there such demand for Belgian players at the moment? It’s not hard to see why when classy players such as Hazard, Mirallas and Vertonghen were playing very well in seemingly ‘weaker’ leagues, they grabbed the attention of larger clubs and since have moved on. There is no doubt the Premiership will be a much tougher test for these new Belgian players but there is no question in my mind that they will be a success not only in the long term but also the short term. So why is Belgium ranked just 53rd in the world? This current Belgian team have real quality throughout the pitch; it’s a mystery as to why they aren’t performing well internationally. They haven’t qualified for the past five major tournaments, most recently Euro 2012 in Poland and Ukraine. Belgium have a very strong defence including Vermaelen, Kompany and Vertonghen, three of the best defenders in not just the Premier League but world football. 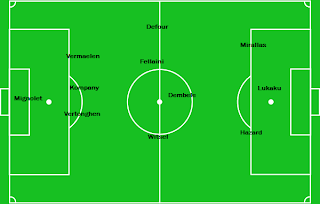 In central midfield they have Witsel, Defour, Fellaini and Dembele who all like to be on the ball and are very talented passers. Fellaini and Witsel prefer to hold in midfield intercepting opposition attacks whilst Dembele likes to play a more advanced role in behind the strikers, Dembele was a real creative force for Fulham last year and earned himself a 15million pound move to Tottenham. Despite Dembele being an attacking central midfielder last season of all the players- in every position, not just central midfield, only Yohan Cabaye (116 tackles) attempted more tackles than Dembele (113 tackles). Perhaps even more impressive is the fact that Dembele, with 86 successful tackles, won more tackles than any other player in the Premier League last season. As you can see, these four midfielders complement each other very well and are a well-balanced quartet. 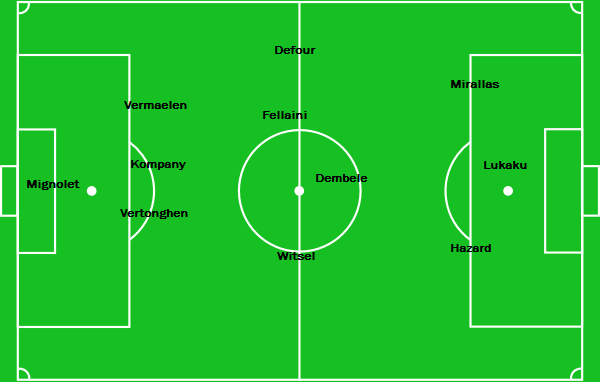 Belgium have some incredible attacking widemen such as Hazard, Mertens and Mirallas. All three are brilliant dribblers of the ball and are dangerous players. Hazard has started impeccably for Chelsea, making 6 assists and scoring once in his first three games for Chelsea. One highlight of Hazard’s play is his agility; he can turn with the flick of a switch causing real problems for defenders, who more often than not are much slower than Hazard. Last year for Lille Hazard scored 20 goals in 38 games and assisted 15 times. A record 90% of out and out strikers would envy. Mirallas and Mertens also possess similar qualities, pace and trickery being main features in both of their games. Belgium have Lukaku to turn on in the striker position. Lukaku is strong, fast and great in the air; he is a handful for any defender purely because of his immense strength. The only question mark over Lukaku is his pedigree and experience, especially when Belgium don’t have a wealth of forwards to fall back upon. Not only is Belgium’s first eleven strong but they also have strength in depth, with De Bruyne, Mertens, and Courtois gaining an avergage of just 5.6 caps each. Is the future bright for Belgium? One would assume so. The majority of Belgium’s players are young, or coming into the peak of their careers. The average age of their last squad was just 24.58 years old which is a good mix of experience and youth. Their key players are even younger than the average age with Mirallas (24) Fellaini (24) Lukaku (19) Hazard (21) Witsel (23) and Mignolet (24). All six players still are a long way from being the finished article with lots of room for growth, which must excite Belgian fans massively. Belgium also have Vermaelen (26) and Kompany (26) coming into the prime years of their career where they'll be performing at their best. You have to say in 3 or 4 years time Belgium should really be inside the top 25 teams in the world when they have such quality players to call upon. A potential Belgium line-up. Surely better than 53rdin the world?